Khumjung is the location of the largest School in Khumbu. This village is about an hour walk from Namche which is a small market. Most of the population in around this place can be seen here. Make your way to the famous Mt Everest Bakery for some palatable coffee, fresh bread and mouthwatering apple pies. To reach Khumjung Gompa one has to start climbing put of Namche, a stroll across a flat area accompanied by another short climb and then a smooth walk down hill into the village. Before starting this trek, keep few water bottles in handy as there are no lodges what so ever in this area. Don’t bother about the hour long trek. The magnificent view will keep you hypnotized. 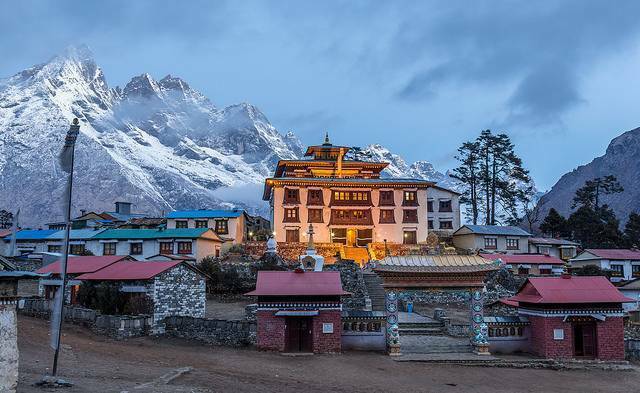 After reaching the place make your way to the world famous Khumjung Gompa which is the safe keeper of the first yeti skeleton. The skull is kept in a glass box. To witness this one needs to give some donation too. Though it is said that the skull is not of a yeti but what if it is. Let’s not waste the opportunity to see the one of kind things in the world.